A new survey from Pew Research Center entitled “How people learn about their local community,” finds that local TV continues to be the top source for breaking news, weather and traffic, and ties with newspapers as the main source of local political news. And when the respondents said “Local TV,” it was clear from the answers that they were talking about local broadcast stations, not regional or local cable news nets, says one of the study’s authors. 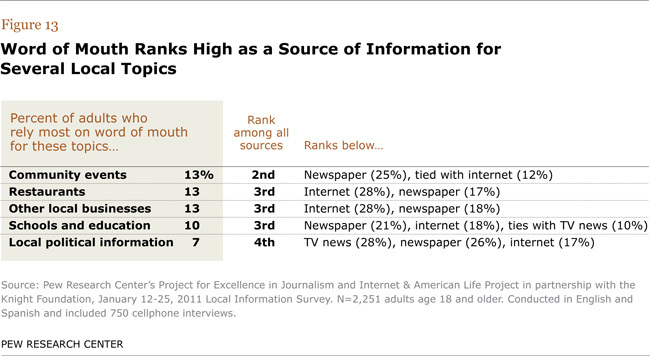 For breaking news, local TV was the main source of information for 55% of respondents to the survey, compared to the internet (16%) and local newspapers (14%). Fifty-eight percent of survey participants went to local TV for information about weather, compared to the internet (32%) and local newspapers (10%). And the reliance on local news cut across demos. Even the web-savvy under 40 generation still looks to TV for news (47%) much more than the internet (22%).